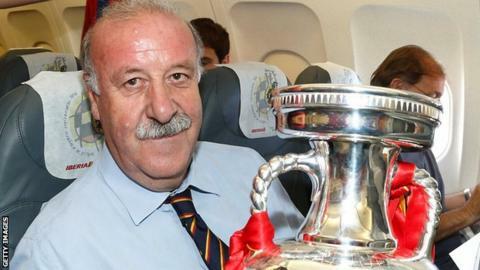 Vicente del Bosque has won two La Liga titles, two Champions Leagues, Euro 2012 and the World Cup. Spain coach Vicente del Bosque plans to retire after next summer's Euro 2016 finals in France. Former Real Madrid manager Del Bosque, 64, guided Spain to victory at both the 2010 World Cup and the Euro 2012 finals. "My retirement is close. If everything goes according to plan it [Euro 2016] will be the end," he said. "I am a man of the Federation and I have to speak to them before taking a final decision." Spain are two-time defending champions having also won Euro 2008 under the late Luis Aragones, Del Bosque's predecessor. They could become the most successful side in European Championship history if they can win the title for a third consecutive time, and fourth overall, in France next year. Barcelona coach Luis Enrique has said in the past he would like to replace Del Bosque as manager of the national team.